As the leading state in catfish production, it is no surprise that the MAFES H. H. Leveck Animal Research Center aquaculture facility was founded in the 1970s, to support the research needs of the developing catfish industry. 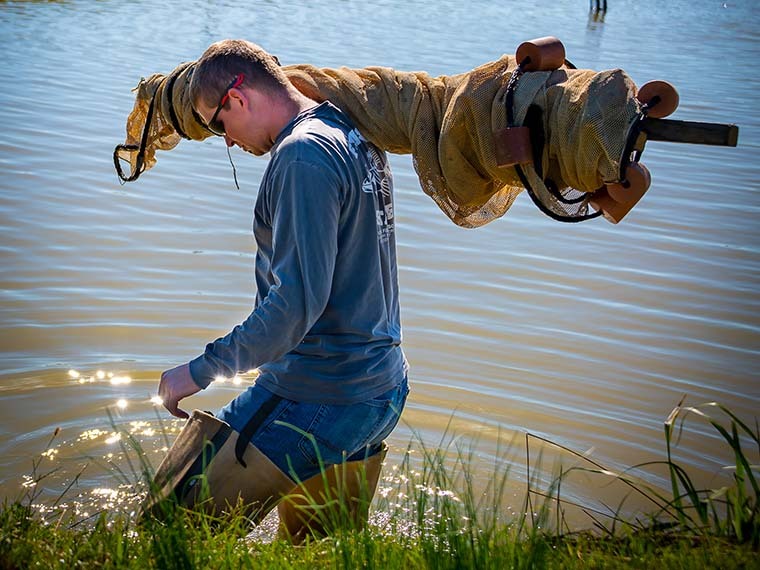 “This was a way that our land grant university could come alongside the public and private enterprise as the catfish industry got going,” said Dr. Peter Allen, MAFES scientist and associate professor in the wildlife, fisheries and aquaculture department. The facility now holds a wide range of equipment for research flexibility, and it includes 86 ponds, raceway tanks—which are also known as flow-through tanks—and recirculating systems. “We have a large indoor raceway building and an outdoor raceway facility that is partially covered. Raceway tanks give us flexibility in holding conditions and are also useful for a variety of purposes,” Allen explained. For example, fish currently in raceway tanks include catfish, redear sunfish, alligator gar, and Gulf killifish, a recreational bait fish species found in the Gulf of Mexico. Catfish can almost always be found in the facility, but they also have other species depending on the research needs such as largemouth bass, crappie, and fish species that are of conservation concern due to declining numbers, including American paddlefish, among others. In terms of equipment, they have many tank systems to support various types of research. “We’re always striving to keep relevant. In terms of ponds, we service them periodically, and in our raceways buildings, we have recirculation systems which allow us to hold fresh or saline water, manipulate temperature, and manipulate photoperiod, which is the length of day and night,” Allen said. There are a number of student workers depending on the time of year or the research that is taking place. At the moment, there are two undergraduates and three graduate students from wildlife, fisheries and aquaculture who are participating in research. Scientists in the College of Veterinary Medicine also use the facility for research projects. The underlying mission of the center is to enhance the aquaculture industry, enhance and support state recreational fisheries, and address conservation challenges with species that are important to the heritage of Mississippi.